Elga, your comment about not enough time to do everything resonates with me. When I first began in miniatures about 17 years ago, I wanted to do everything, and aside from glass blowing and pottery, I've tried. That's why I have so few completed projects. I really do enjoy all the different aspects of our hobby. I sort of fell into knitting as a specialty, and since I can do needlework sitting in the same room as my husband, it was easier to do that instead of isolating myself in the basement. No longer having a basement, I now prefer the sofa to standing in my tiny laundry room/shop. I'm glad we're "hot" right now. This is the only place I've earned that description. I've enjoyed the knitting thread and would love to see more potential mini knitters here. I finally decided I needed to join these forums...my screen name is dollcreator, but some of you know me from the PP list as Marianne (from BC Canada). I have the same problem as most, I can knit continental, and use it when doing fair isle, or double knitting, but I absolutely hate purling that way. I grew up in Holland, and yes, I learned to knit very young, I am fairly sure my mother taught me to knit when I was about 5, and further learned in school. I distinctly remember learning to knit a sock, it was in cream coloured cotton, but I don't know if I ever made the second one....When I started a yarnshop, and came across the 'magic sock yarn' that did automatic fair isle, I started knitting socks, and haven't worn any other socks since. I also learned cross stitch in school, still have my first project, and when I looked closely at it the other day, I was shocked to find that not all stitches cross in the same direction....guess the teacher didn't pay any attention to that!! I originally learned to knit holding the right hand needle under my arm for support, and just use my index finger on my right hand to 'flick' the yarn around the needle. I have had to change the way I hold needles once I started using circular needles, and now hold the right hand needle like a pencil, but still 'flick' the yarn. I think the word 'throwing' comes from the fact that the British actually drop the right hand needle, pick up the yarn, wrap it around the needle (throw it), drop the yarn, pick up the needle and finish the stitch, which I think is a very slow awkward way of knitting. And I am of the opinion that it is wrong to teach left handed people to knit opposite (or mirror image). Knitting is a two handed craft, and yes the thread can be carried either in the left or right hand, whichever feels more comfortable, but teaching them mirror image creates numerous problems, since all patterns are written to go from right to left, not from left to right, and if people knit mirror image, they have to reverse all the directions, which makes things more confusing. I love Venne threads for mini knitting. The mohair actually is not all that hairy, and does work quite well for mini knitting, their wool is quite nice too. I am actually at the moment contemplating bringing in the Venne threads to sell online to people in NA. I haven't decided yet if I want to go through the hassle of applying for a tax certificate again, but I can only get wholesale prices if I have the tax number. And I am going to have a hard time selling products if I have to purchase them at retail.... I guess I'll have to do a poll and see how many people would be interested in ordering it from Canada instead of the UK, to see if it is worthwhile. Anyway enough babbling. I'll answer any questions that come up to do with just about any fiber craft, I do them all. Welcome Marianne, so nice to see you here. Thank you so much for your input--glad to know I'm not the only one who finds it difficult to purl with the continental method!. I've had good friends show me and try to teach me how to purl with the thread in my left hand and they make it look so easy but for some reason I just can't get the hang of it. I can do it, but it is so slow and awkward. I'm going to keep trying though...it is definitely a more efficient way to work two threads at once. Sue, I am always so amazed at your ability to do so many different kinds of miniatures, and do them so well! You are such talented woman and listen, I saw that picture of you from 20-30 years ago you were indeed hot! Tamra, I am looking forward to seeing pictures of your knitting soon! Elga, I think it is very civilized that so many Europeans I know have learned to knit in school. I think it helps children learn great hand eye coordination and gives them a very relaxing past-time to take with them for the rest of their life. So... it really sounds like that before I develop knitting memory, I do really need to have an open mind, and learn to knit with the thread in both hands if I want to make a fair isle design? hmmm, this is going to get really interesting. (uh oh....) I printed the sweater pattern last night, I'm going to print the flowers next, and see which is easier, found my Venus Dodge book. hard to choose from just photos. The inexperience person in me needs more pictures! I just want to stitch something that is square like a blanket. or scarf, silly? just to get use to the tiny size.... the potholders are calling me. But I only bought one color of DMC flower thread. I do think I understand the slip stitch, so thanks for sending it to me to this link Althea. My order from the UK should be here early this week, will see if we like any of these options. Marianne, I'm glad that you joined us! Tamra, if you want an easy pattern to start you off that uses only one colour, why not knit this cot blanket? http://www.helena-petitefashions.co.uk/free.miniature.cot.blanket.pattern.html. You can do it with the flower thread, and I'd probably use 1 mm needles. It is a fairly easy pattern, but I guess the purl 3 together might give you a bit of a problem. Try it though, one easy way to p 3 tog is to slip 2 stitches each purl wise, purl the next stitch, then pull each of the slipped stitches over the purled stitch. Tamra did you received your package yet? I am so curious what you think of the thread. Than I have a question too. I have problems to show my sweaters in a natural way (hop you understand what I mean). I don't want to put every sweater on a doll, but I don't know how I can show the sweaters. I have seen that Sue and Althea show them in a realy nice way. Do you buy these things (I don't now the word for it) or made them yourself? Do you do something with the sleeves to let them 'hang'. At times I have seen instructions for making some, both from wood and fabric stuffed ones, but can't remember where right now. Christa, I just received the thread order from the UK this morning. I was very happy to see the package before I left for work. Two weeks! I did ok picking my colors on everything except the turquoise blue. It is really turquoise, but the rest of the colors are fine; all are within my color range. The Venne 70/2 colcotton is thin, but I'm used to seeing 50 wt and 100 wt YLI, Tire, Clover, Etc, silk threads for Petitpoint, so it doesn't really seem much different... and I have a lot of Gutterman on Blue tubes and AVAS (100/3) Silk too, that I've collected over the years for the stash. I did not order any Venne 34/2 colcotton. Yep, the mohair is pretty fuzzy, but I don't see any reason not to try it and discover for myself, that I do / or do not like it. It definitely has that soft angora fuzzy look to the fiber visually, so Barbie or a Teddy bear may get a new sweater. Althea's note that it will be visually out of scale, has been accepted, but I can use it for the transition projects. Althea, your comment is much appreciated, as it helps me manage my expectations for the visual outcome of the project. I do appreciate the honest assessment. I started a very small piece of Petit Point while I was waiting for the threads to arrive. I'm very close to completing the stitching that I want to finish this first, and then I'll begin my knitting experiment. I am trying to finish things I start, before I start something else! I'm on a roll for 2014, I did finish both of my life size scarves. In reference to your question, you can carve your own mannequin or form for your sweater from basswood, pear wood, etc, or sculpt with polymer clay. You can make a plaster mold and use an air dry slip, like flumo, that doesn't require a kiln. In lieu of plaster molds, you can also use a two part silicone mold compound, around your sculpt and then push polymer clay into your mold to make multiple forms. Heidi ott has a nice mannequin too. I especially like the base of her mannequin. Jane Davies in the UK has the perfect form for sweaters. She gave us this form for our costuming class, Belle Epoque, It even has half arms for sweaters. Thinking about it; I would rather use this for a sweater, then for my dress. I think I would roll up some acid free tissue paper to give the arms of the sweater a little 'roundness'. Of course this part of the response is just theory, because I haven't knitted a sweater yet! But I am determined to knit a sweater. Thanks for the ideas for the molds. I think that is a good idea to try. There is one picture with a blue vest. It needs some buttons but the knitting is finished. It is a combination with venne colcoton 34/2 and mohair. That's why I want it to show you. For a long time I've blocked wet sweaters on a mannequin with a piece of bulky yarn threaded through the sleeves and pinned to the ironing board below. When they dry, the sleeves appear to be hanging naturally. Earlier this year I made a mannequin out of silicone molding material so that it is soft, and pins can be poked right into it. Yes, I have made my own mannequins, too. So many of the purchased ones look like Barbie dolls--big bosoms and impossibly thin waists. They work for corseted Victorian styles, but not for more contemporary styles in my opinion. I've carved them or used polymer clay to mold an original and then made molds. The resin ones were most successful. Christa, I see a most beautiful mohair and Cotton sweater at the bottom (photo5). The 34/2 is this similar in size to Gutterman Silk 30 wt on blue spools? I wish I had ordered the 34/2 at the same time. Photo 1, what is the fiber in photo 1? Yes, I do like it! it is also fun for me to see your other projects in progress. I want to be able to knit the ribbing at the bottom of your blue and white piece. I have so much to learn, but it is a joy to see these items in progress. Tamra, the Venne 70/2 is about the same thickness as the Gutemann S303 on the blue spools. the 34/2 is about 2x as thick. I think the 34/2 is probably closer to DMC flower thread that is no longer made. Strangely the YLI 100 is supposed to be the same thickness as the 70/2 as well, came across a website somewhere where they said that the Tex was the same. and I have knit with the YLI100 and the 70/2 interchangeably, and they do work out to about the same gauge. Sue, Thanks for the photo. That explains a lot. Tamra, In all these photos I used venne 34/2. The sweater of my elephants was placed with the pattern in Dolls house Netherlands, that is a dutch magazine. 34/2 is much easier to work with when you are not so experienced, that's why I use it in the magazine. If you want I can send you a mini spool of venne 34/2. Just so you can compare it with your other thread. Let me know if you want that. In most of my sweaters I use the ribbing, two stitches knit and two stitches purl and repeat that for the rest of the stitches. And in total 5 needles. I've decided to work on the sweater that Sue R, posted the link, as I am dreaming of sweaters, I can't find a reason to talk me out of trying it first. Work is calmer and under control, so I think it is time to make a run for trying to learn how to read a pattern and see if my head and hands can really communicate with each other. I've rolled a tiny ball of DMC Medicis wool, and have my size 0 needles, and will take a ball of regular yarn and needles in case she gets freaked out and can't see the stitches. At this size 0 needles and Medicis, I can see without magnification; but I'm so used to stitching petitpoint and embroidery threads, that Medicis looks gigantic. So, when I knit the first two rows, it says K1, P1, am I creating ribbing for 30 stitches for two rows? Guess I can try it and see if it makes sense or not. I do not understand why I have to have 3 needles going at one time, though, guess I'll find an answer tomorrow night. I just picked up my life-size practice piece last Saturday night, and I am relieved that I can still purl, I was worried... but my fingers and brain did remember! Hopefully, tomorrow is the beginning my knitting adventure. I hope if there are any other beginning miniature knitters out lurking on the forum that you will join me. I really want to learn to do this, before I sign up for a class at GS. I do not want to put any teacher in the agony of teaching a total inexperienced knitter, so I am looking forward to this new adventure. I love all of the knitting classes that I've seen in the Guild School class offerings, (and I hope it is ok to admit that I'm a little crazy), but that sock monkey class has stolen my heart, and had I already been able to knit, that class would have brought me back to GS begging for entry! I watched UTube yesterday to remind myself how to cast on, and that did work. Tamra, yes the first two rows will form a ribbing. I looked at the pattern you are talking about, they are using three needles because the sweater is knitted in the round, so at the end of a row you don't turn the work you just continue on, also this sweater is started at the top and not the bottom. Sue did you notice that? I have never done in the round knitting, I am just wondering if this pattern isn't just a bit difficult for a beginner. Tamra, on this page if you scroll right down there is a free pattern for a sweater with the front, back and sleeve all knitted separately and stitched together afterwards, somehow I think this one would be easier for a beginner. I agree with Elga, the pattern that Sue linked to is way too difficult for a beginner. It is knit in the round, and you are not ready for that yet. The pattern on the Buttercup miniatures site is much better to start off with. It is sized for a 4" child doll, but it does use 1-ply thread, which is about the equivalent of the Medicis. Don't know if knitting a sweater is necessarily the best thing to start off with knitting with tiny needles and tiny thread, but at least with this one there is not much shaping being done, and it will teach you to sew tiny knitwear together.....not as easy as it sounds. I'm knitting with lace weight yarn tonite at the meeting and regular needles per the instructions; I don't want the teacher to quit on me before I even start.... I'm guessing it is Barbie size....I did do a row of 30 stitches on the size 0 needles last night with Medicis, and that was really challenging at 11:00 pm. I cast(ed) on two needles for the first row on some tiny "x" mm size needles that I bought a long time ago from someone on eBay. I am sure they are not the 00000 sizes... This is going to take some getting used to it... But I did work myself down when I was learning to do PP, so I do think if I keep struggling through the process with my friends in the forum, this too will improve! Thanks for the other pattern links, I will see if the Buttercup pattern will work. Tamra, I'd advice you to not look at the pattern of those mini sweaters at all. It is knit in the round on 4 needles, with no seams, just going around and around. You are not ready for that. It is not a pattern that has you cast on 30 stitches for the back and knitting the back, then casting on 30 sts for the front. The 30 stitches are for the back and front combined. You would be better off with this pattern: http://www.buttercupminiatures.co.uk/pdf/patterns/simple_childs_jumper.pdf. This sweater is a straight piece knit back and forth for the front, the back and the sleeves and then sewn together. Yes, Elga, I did figure out I was stitching at the neck down last night after I tried to cast on and just stitch 30 K1, P1 (repeat combination for set of 15) and just trying to stitch with Medicis was hard, and that is when it dawned on me that I would be stitching down. Still I do think this is doable if I scale UP to life size stuff, and go to circulars needles. I have a larger pair; I just didn't take them with me tonite. I got the three needles loaded for the round, 10 stitches each for the neck, and formed my little triangle with my lace weight yarn, and size 1 or 2 needles per the instructions, Then... are you ready... I sat there looking at it and said to myself, absolutely nope, this is not going to work... but why not circular needles? 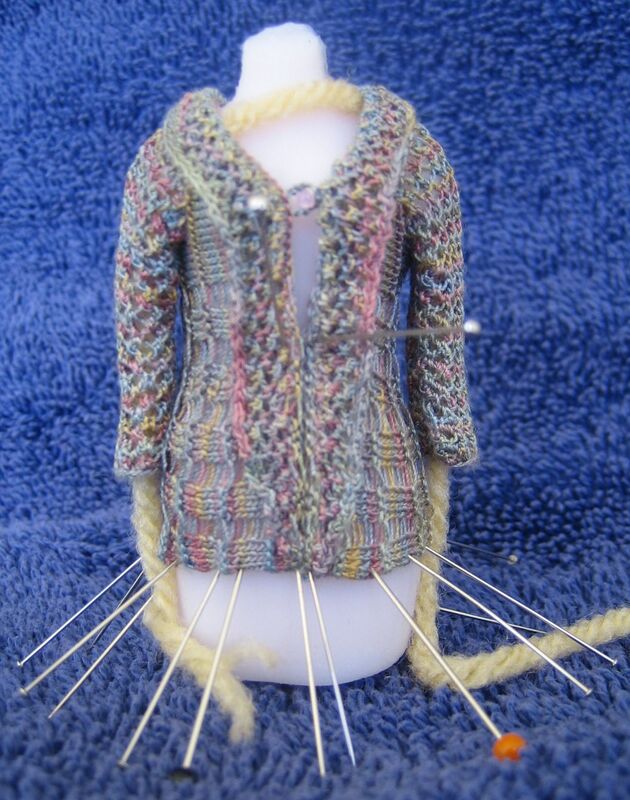 Sharon DeVries talks about using circular needles all the frequently in her blog. Marianne, I like the jumper sweater idea. Will print and see... Yep, the simple child jumper looks like a good possibility for a starter project and it doesn't have the "NOT RECOMMENDED for a FIRST miniature knitting project" in the intro. Thanks for the suggestions, and I am taking the experience and wisdom and going with a new project. The group was fun; friendly, it was like going to mini club... I already knew two people from Saturday's crochet class from this past Saturday's meeting. They are both crochet / knit classes, but I decided Saturday classes would be crochet; and Tues/Thur would be to knitting. Tamra, I have some of the circular needles that Sharon recommends, I don't know if she actually uses them for knitting in the round, I have one of her christening gown patterns and will check it out later today. My concern with using it is the small number of stitches versus a very long needle, so I Googled and found these instructions, my brain is still spinning, I think I agree with Marianne here, this will be very difficult to do with our fine threads once you get to true scale knitting. So I guess the best advice is, stick with two needles and back and forth knitting patterns, all those mini sweater ornaments are knitted with fairly thick yarn and needles compared to what you will want to eventually use for true scale knitting. Yes, Sharon does use circular needles, but not for knitting in the round. She uses them for knitting back and forth. I have done the same, since they are attached to each other, you don't run the risk of losing one when putting it down. It is also good for not running the risk of the stitches falling off the end when having a lot of stitches. Some of her patterns (and other's as well) can have a cast of 100 or more stitches (like when you start with a ruffle for a dress). I have done quite a few of Sharon's patterns. Sure, you could use the magic loop method, I have used that method for lots of RL things, like socks or sleeves. But once you start knitting with sewing thread, it becomes impossible, since the thread tends to get stuck in the groove between the needle and the cable. it is virtually impossible to avoid that groove when manufacturing, since you are going from metal to plastic, and it has to be attached somehow. It is bad enough to try and get the stitches back up on the needle when they have slipped onto the cable when you've got a lot of stitches, and I certainly would not want to do it for knitting in the round. I have actually put a small elastic band on the needle just before the cable to stop them from slipping off when knitting back and forth on them. To tell the truth I don't even remember posting a link to a sweater pattern. I wouldn't recommend knitting with four needles to a beginner either. That said, a cardigan can be knit from the top down without using four needles, but with sleeves, front and back together. The side seams and arm seams still need to be sewn, but the more seams that can be eliminated, the better. I'm going to attach a photo of an early sweater I did from the top down with a diagonal seam from the top to under the arm. The photo is of the back, not the best view, but it's good for showing that seam (pattern is a little wiggly at right). This style is usually done in the round, but you can see it doesn't have to be. This sweater was done before I began blocking a little more realistically. Did your knitting teacher talk about using smaller needles for ribbing, Tamra? I think that's one of the things that is often overlooked in mini knitting. Do you want some more DMC Flower thread? What color? Are you still on Lincoln Way? Wouldn't circular needles without a joint be amazing? Ain't gonna happen. One alternative way to knit a seamless tube is double knitting. That's the way the sock monkey is done. I don't have any problem with stitches falling off, and I always use double pointed needles. They are so much more versatile, and if you continue to practice, someday you're going to want to knit in the round. Sue Krzysko brought to class some rubber earring backs which fit right on the end of a needle and work nicely for those who are afraid of losing stitches. I forgot to post the picture, but now I can't see how to do it anyway. I did it before with no problem. ? I found the link I posted to a sweater I thought looked simple, but I confess I didn't read the pattern. Sorry.